There are many reasons to calculate the slope of a property. 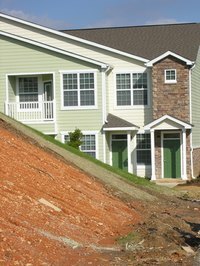 It may be essential for a construction or landscaping project or to meet local or state building regulations that vary based on a property's slope. Slope, or pitch, is essentially the steepness of a surface, and that steepness is expressed in rise and run--the ratio of vertical increase to the horizontal span--or in degrees or percentages. With an assistant and a few common household tools, it's not that difficult to figure out a property's slope. Hammer a stake into the highest point on the property. Move to a spot 50 to 100 feet downhill, avoiding any hills or valleys along the way. Drive a second stake into the lower ground. Walk back uphill and tie one end of the string to the stake on the higher ground. Place the string level on the middle of the string. Lift the end of the string at the lower stake and hold it to your torso as the assistant reads the string level. You can use the stake on the lower ground if it is tall enough. Continue adjusting the string up or down until the assistant tells you the string is level, which means that it's creating a perfect, 90-degree angle with your torso. The result will be a right-angle triangle, which allows you to easily calculate the slope of the hypotenuse (in this case, the ground). Measure the length of the string from the stake on higher ground to your torso. This is the x-axis number. Measure the distance from the ground to the point where the string meets your torso. This is the y-axis number. Calculate the slope in percentage terms by plugging the recorded measurements into the equation y axis / x axis = slope (x 100 for percentage). If the length of the string is 50 feet and the height from the ground to the point where the string meets your torso is 4 feet, the slope expressed as rise over run would be 4 (rise) / 50 (run), which can be reduced to 2/25. The equation would be 4 / 50 = slope = .08 (x 100 for percentage). This means the slope = 8 percent. Calculate the slope in degrees by using the following equation: [slope percentage] x 360 = [slope in degrees]. 360 degrees represents a full range of motion, which is why you are applying the percentage to this number. In the above example, we would find that .08 x 360 = 28.8, meaning the slope is about 29 degrees. What Is the Minimum Slope of a Roof?